Steeds of the Tireless mount selection box - back again! Thread: Steeds of the Tireless mount selection box - back again! We already said no 2 months ago. Do we have to say it again? What's going on here? Are we supposed to go in a frenzy for people to realize that this isn't wanted? Terribly disappointed. If the box contains what I think it does, I'm not renewing my VIP. Shameful though, considering I just bought it. Last edited by Fraushgrish2; Jul 16 2018 at 05:44 PM. I don't think it is what your thinking they removed that and went back to the drawing board as we players said no to it, and suggested add other old steeds and festival steeds that we can no longer get. these won't be the deeds mounts. Pontin Level 120 Hobbit Burglar Leader of Second Breakfast Crickhollow Server. Alts: Legoan Elf Hunter, Belladonea Hobbit Minstrel, Unnari Dwarf Guardian, Jorunn Man Captain, Sallyberry Hobbit Warden. Maradoc Hobbit Hunter. Laurelin Server, Edwell Man Hunter. Here's a guide to making ABC files and my Screenshots of Middle-Earth. Also can follow me on Twitter for Adventures in Middle Earth and more! 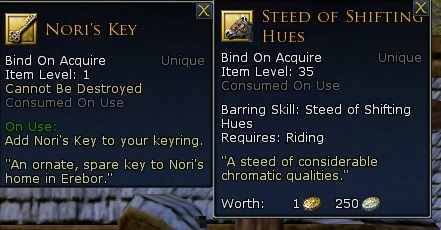 Does that description remind you of a certain deed/instance mount you can get? What is the context of these screenshots? Key, I am uncertain of. The Steed is probably a rip off of Isengard T2C instance cluster completion (in the box). This makes me not want to keep playing the game. I'd rather go spend money on a subscription for other games, where I know I can get access to all the content like all the other players, without having to spend money on cash grabs like this. It's not like you can get what you want either, it's all RNG. Shameful indeed. But where did you see these tooltips? How in the world is a mount an advantage? How does someone having all the bling bling ruin your game? Oh that is right... it is you. It is an unlevel playing field (in life too), learn to enjoy it at your level and your pace. Its meant to be fun yes, but most wouldn't like it if its the same mounts in the box as before (most likely not). but as many of us worked to get the mounts, it don't seem right to give it away in a box, as its really the only motivation to do old raid deeds, I've had players say don't care about deeds much and won't do it unless end game. other same way but say they will help and do it cause there's a reward at the end that is a mount. and that's motivation, so players can do older content as well (Besides the FI). ... but as many of us worked to get the mounts, it don't seem right to give it away in a box, .. I hear ya, and I get why... I just think it is self-imposed issues. I did well in my work career and I worked hard.... my neighbor didnt but he drives a Porsche! He got it because of mommy and daddy. Oh wait.... how does that effect me? I think having dreams and goals are good but when people have to keep things in perspective.... stop ruining your own fun. I cant afford one, wont ever afford one... why in the world do I think it is unfair that Joe Blow has one? Another lootbox update. How many since mordor launch ? 10 ? Imagine all this effort invested elsewhere , we'd have a decent instance cluster for sure. but apart from designing , i am pretty sure they need to take those stuff through lawyers etc. This gambling will stop one day and it will end with noise. They won't stop it themselves ofc , but someone else will end it for them. I love it when they find ways to make money , since it's good for the game , but this is getting out of hand. They invest on lootboxes more than content. Gaming industry invests on gambling lootboxes to make money instead of developing content. Gamers spend their time on twitch , watching other people play instead of doing it themselves. The people that stream find ways to get payed for it , instead of getting a real job. Games cost the same money for less than half the content , comparing to 10+ years ago. Those same games use techniques such as grind to add fake and bloated duration to their tiny games. This strangely starts to remind me of another form of entertainment but profanity won't let me say it. This is a sad Era. I'll leave it to that. If they were to decide to remove loot boxes, they have to phase it out. To just drop a hammer when some players spent real cash on keys would not go over well. Hell, players who buy boxes would probably freek out too. Not opposed to doing it btw... but for me, it is just a symptom. People scream it is unfair but the reason it is removed is because it is a form of gambling. Has nothing to do with fairness. Some items simply shouldn't be available for cash. I'm not going to waste my sleep over someone getting something from the box that I worked for for a long time - because it's a game we play for fun. That being said, gating specific items behind the harder content/long grind/RNG luck is a vital part of games like LOTRO. It gives you a goal and a sense of achievement. You don't actually need to engage in the grinds. You don't actually need that gear. You don't actually need to buy anything from the Store. You don't actually need to do the group content. You don't actually need to play endgame. You don't actually need to play alts. You don't actually need to care about what other people buy from the Store. You don't actually need to focus on the fact that others buying things in the Store likely does actually affect what's available in-game, and how it is obtained. You don't actually need to realize that much of what the Store offers would be considered "cheats" in the absence of cash changing hands. I totally get why we see these all the time. And many more. Not only does embracing such thinking allow us to keep plugging away at a game while we turn a blind eye to what's going wrong. But, it has a certain pseudo-intellectual appeal to it. It's seductive to play the contrarian. Especially when doing so can also come along with the opportunity to play aloof, cool, and collected in the face of others who are dismayed or upset. But, more and more, I find this sophistry and excuse-making to be reminiscent of people just telling themselves what they want to hear in order to justify their own continuing addiction to a game that they're simply not yet ready to let go. In my case, I find myself thinking and even agreeing with a lot of the above. . . until I realize that all I'm really doing is rationalizing. . . I'm just putting on more and more sets of blinders so that I won't have to see what's happening around me. So that I can keep visiting Middle-earth. This makes me sick. As in, physically nauseated. This mount selection box was originally added in response to player requests for hard or impossible to obtain mounts, however it is clear from the variety of responses that we were off of the mark. Thanks for all the feedback. We will remove this mount-selection box from the prize list and head back to the drawing board. That feedback thread has already been conveniently deleted (!!!) but a cached version can still be accessed https://webcache.googleusercontent.c...&ct=clnk&gl=pl Please read it for context before the mods delete even this cache. Who do you think you're fooling, SSG? This is the lowest and dirtiest trick I've seen. My financial support for this game stops right here. If LotRO is run with such scummy tactics, it is not worthy of its Tolkien IP. This is sick. I'm gonna take a wild guess on this and say that the horse will be noticeably different to the steed of many colours, so that it cannot be mistaken for the metadeed horse. I could be wrong, but I seriously doubt they'd go ahead with adding a horse that looks the same, given the earlier feedback that they got. That said, I wish they'd just stop updating lootboxes altogether. Stuff like new and fun steeds should be earned through doing content IMO. Treat others as you do your best pictures, and place them in their best light. I suspect the same when it comes to the upcoming mounts. However , nothing surprises me anymore , i've already seen worse mess ups than this. I have around 35 keys acquired from dailies and box slivers. Will use them after patch and see what happens , i should be able to get the mount box. I bet other players will do the same , although i wish not many support this by buying store keys. Wishful thinking , i know. In any case , my credit card is ready for the next game in case my suspicions are wrong , i've done the research already. Lotro lifetime always felt like the best money ever spent , but SSG 'fixed' all that by making me feel every $ i spent since lvl 115 was the exact opposite. Quite a feat for sure. Some will continue to kiss the boot even as it stomps their faces. Well, please do let us know, because I won't be opening any boxes today or in the near future. Ash cap always in the way, especially at the moment with Thrang challenge. I have a small stock of earned keys, but honestly, I don't bother with the dailies to earn them any longer, because the ash cap is ever looming. My face is fine thanks, because I understand the concept of my own comment and how it was written, without a rage roll. Some yell at things they have no idea about, based on incomplete or outdated information. The patch notes refer to a warsteed-cosmetic set, which neither the current Orthanc steeds offer.